The lovely colour picture above was taken by Bob Egginton who wrote in 2016 to John Sutton. “I have attached a picture of the Marcos outside the house where I lived in Oakville in the early 60’s. The picture was taken only a few days after the car was collected from the docks in Toronto where it had been shipped from England. An amusing incident occurred when the car was imported. Because somebody had written on the import papers that the chassis was made of wood the Department of Agriculture was called to examine it, presumably in case it had any nasty Beatles or something in it. When we got to the docks the car was standing all on it’s own in the middle of a large warehouse with a rather puzzled looking official who, after some acid comments about people wasting his time, signed the forms to set it free. 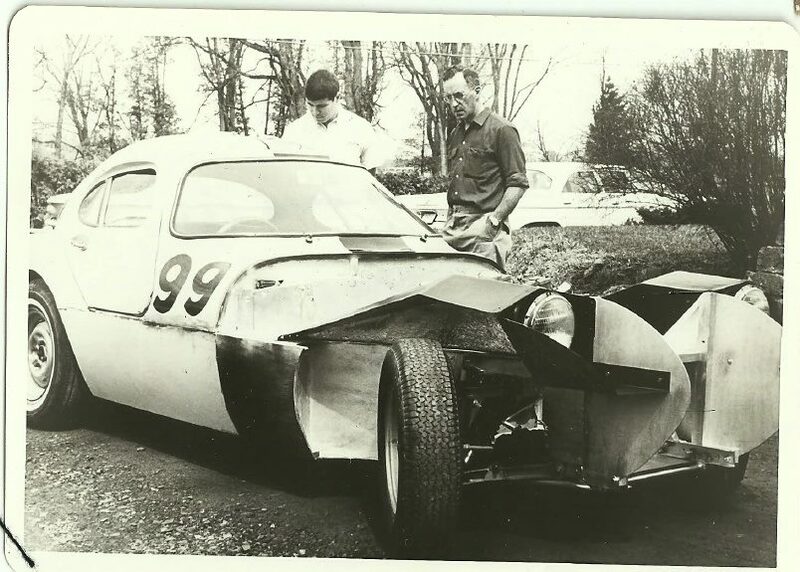 Exported as a completed car, it is not known if it had any earlier racing history in the UK, and it might even be the same car as one of the other cars mentioned in this register. Above as raced by Barry Webb at Harewood Acres (Canada) in 1964. Above pictured as found by David McCubbin. A long term custodian of the Gullwing, David McCubbin passed away far too young and could not finish the restoration of the car. By the time the project stalled, a new chassis had been built. On the pictures below, taken at McCubbins residence, you can see the assymetrical chassis. It is believed two of these leftover chassis, as used on the earlier Gullwings were finished as Luton Gullwings. The other being the Prior Le Mans car. When David’s widow decided to sell the car, the project was taken on by John Sutton who moved the car from Canada to his new residence in Florida. There restoration has been restarted and nice progress has been made, as shown in the pictures below, taken early 2016.